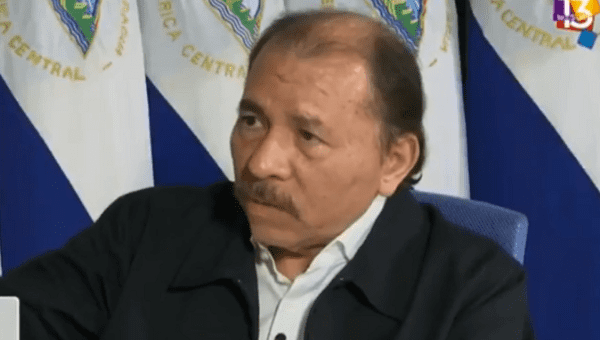 In an exclusive interview with TeleSUR Nicaraguan President Daniel Ortega says he wants to dialogue for peace and wants the US to respect Nicaraguan sovereignty. Ortega says that the country has experienced extreme violence over the past several months at the hands of the “extreme right” of Nicaragua and U.S. elected officials who have always opposed the Sandinista revolution since it emerged in the 1980s. The president went on to say that the violence is the fruit of U.S. officials who are working with poor paramilitaries within the country who want to knock down the Sandinistas. Since protests broke out in mid-April to contest social security reforms, the country has been thrust into unprecedented socio-political turmoil that has left some 350 people killed, according to the NGO Nicaraguan Association for Human Rights (ANPDH). At least 2,100 have been injured, says the ANPDH. The president tells Villegas that the government is “building strength and wants to resume peace.” He reiterated several times during the interview that he is willing to sit down with big industry and the church in order to resolve this conflict that continues to kill people. Just two weeks ago a policeman was tortured and killed allegedly by opposition forces, and vandals set fire to classrooms and burnt education equipment at the National Autonomous University of Nicaragua (UNAN). The Nicaraguan president said that Nicaraguan businesses negotiate with U.S. officials to create U.S. laws that damage his country, especially the NICA Act, which aims to cut the government of Nicaragua off from loans by international financial institutions. Ortega said it would be “ideal” to sit down and talk with U.S. president Donald Trump, but that the “political right now are being manipulated by the extreme right who negotiate with U.S. officials” to hurt Nicaragua. Ortega has criticized bishops of the Episcopal Conference of Nicaragua as being “coup leaders” for collaborating with the opposition during the previous attempts at national dialogue since violence broke out three months ago. “Armed groups started attacking the Sandinistas, police, and burning municipal buildings. … This is the work of the militarized right,” says Ortega. They are attacking politicians who support the Sandinista Front, asserts the president. Ortega pointed out that there are similarities between the right wing protesters in Nicaragua and those that attempted to topple the Venezuelan government in 2017. In both cases violinists played amidst the presence of police and young women screamed similar phrases in violent protests in both countries. “U.S. agencies,” points out Ortega, “are financing these youth.” The president says that young Venezuelans are being paid by the United States to come to Nicaragua to protest. The president says that the U.S. has a strong presence within the country, funneling some $US30 million in USAID financing into Nicaragua. Will there be justice for those killed, inquires Villegas, even if it turns out some people died at the hands of government authorities? “Yes,” says Ortega. Justice is “for the family of the victims, and I’ll bring justice,” to these deaths, asserts the president. The president denied any support or financing to paramilitaries during these months of protests.